The use of copper devices, especially bracelets, for anti-inflammatory/anti-arthritic purposes goes back into folk-lore. 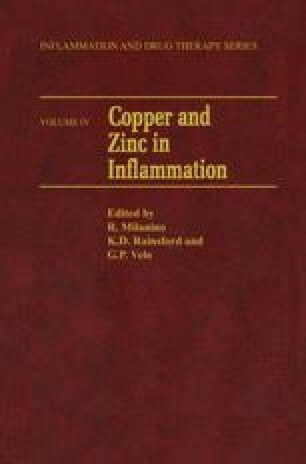 Yet it is only of recent times that any serious attempt has been made to assess the validity or otherwise of the hypothesis that metallic copper can generate or promote anti-inflammatory activity in vivo. In providing some evidence for the probable therapeutic value of the copper bracelet, Walker and Keats1 suggested that the components of sweat (especially amino acids) may act as cupriphores. Subsequently, the dissolution of copper in sweat was reported by Walker and Griffin2. Further evidence for the hypothesis was provided when Walker et al. 3 observed that 64Cu-labelled bis(glycinato) copper(II) could permeate intact cat skin. In addition, the perfusion of human skin by copper(II) acetate has been reported by Odintsova4. Some evidence for the reactivity of metallic copper may be adduced from the observation that the crystalline solid bis(glycinato) cop-per(II) monohydrate can be isolated from an aerated aqueous solution of glycine containing metallic copper5.